This is the account of the first time I ran the Hillary Trail back in January 2012. At the time I was the youngest person to run the trail and since then I have completed the full Hillary Trail twice more, currently holding the record for fastest woman to run from Muriwai to Arataki. Why. 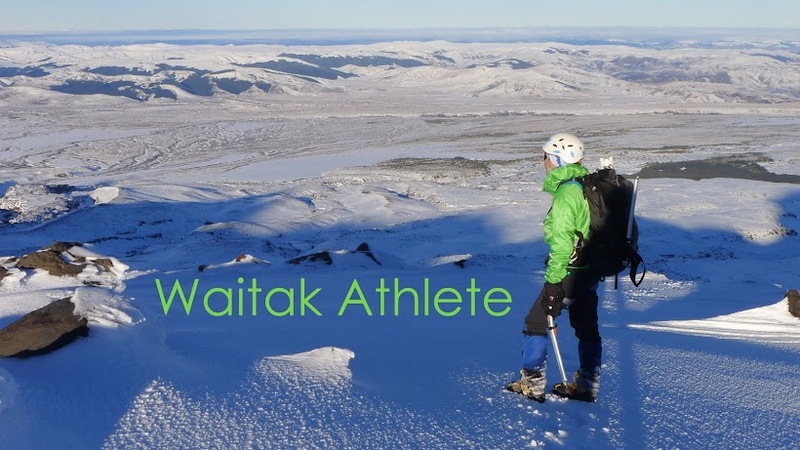 This word is frequently heard by endurance athletes from uninitiated people who struggle to comprehend the motivation behind thrashing your body and pushing your mental toughness for hours on end. It also a word I was asking myself in the days leading up to the Huia Road Bush Runners’ annual Hillary Trail run. Why run 73km of bush trails (with 3,700m of climbing) when ordinary 15km runs are enjoyable? The best reason I came up with was the same that George Mallory gave in 1924 when asked why he was attempting the first ascent of Everest: “Because it’s there!” My longest run to date was just under 30km so attempting the full Hillary Trail was merely doubling that distance and throwing in a bit extra for good measure. Accordingly, at 6am on the first Saturday in 2012, ten of us were assembled at the end of Horseman Road to tackle the challenge. With a hint of moisture hanging in the air, we started off through the bush in the half light of dawn. Conditions were perfect for running – overcast with a gentle drizzle and no wind to drive it into your face. We settled into an easy rhythm through Goldie’s Bush but despite eyes straining to make out the track, a hidden root saw me roll an ankle within 20 minutes. 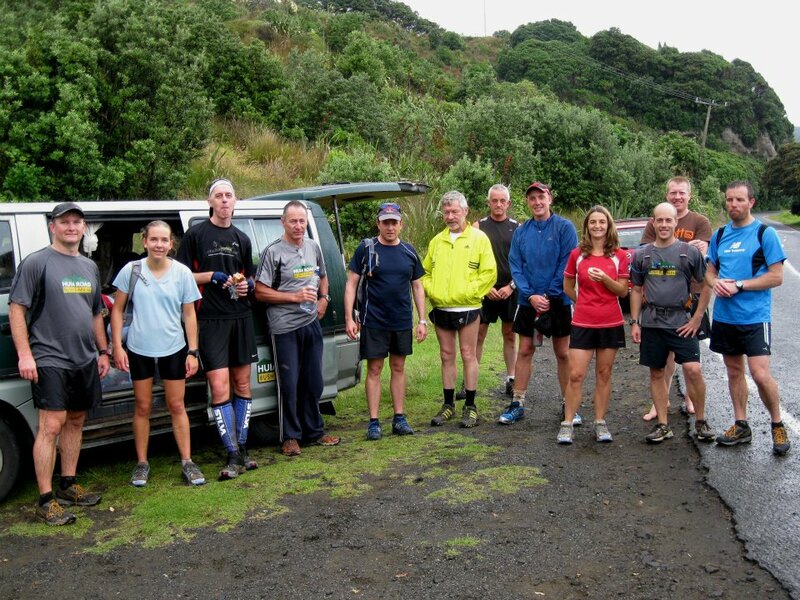 It was fully light by the time we reached Constable Road and the many muddy/narrow/overgrown patches on the Te Henga walkway made for interesting running with the moody west coast as a backdrop. Michael Rodliffe, Penny Kirkwood and Jim Davidson powered away, followed not too closely by the peloton of Simon Clendon, Shane Absolum, Tony Bus, Dan Roberts, and myself. Stuart met us with his camera as we loped across the bridge to complete the ‘warmup’ leg. A quick refuelling stop then it was jogging up beside the stream and over the sand dune to the conveniently placed ‘small room’. Our pack opted to take the longer official route around the northern side of Lake Wainamu despite the footprints of Jim, Michael, and Penny clearly heading towards the more direct track. 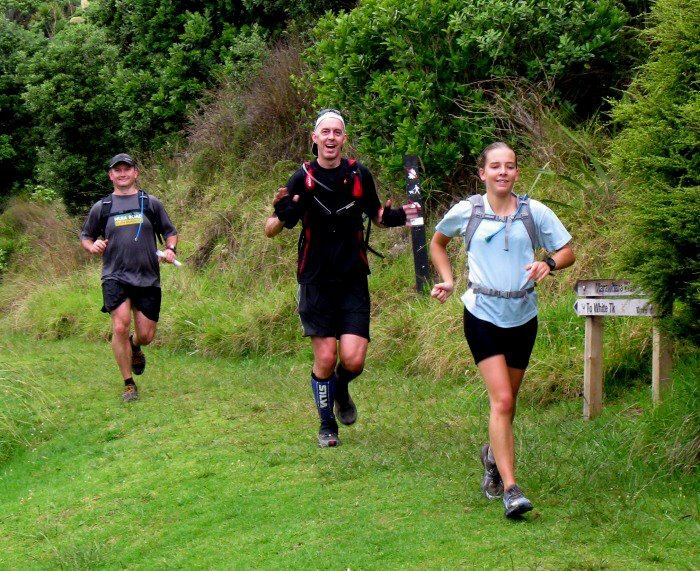 A steady climb up Houghton caught us up to Max (who ran stages 2 & 4) before emerging onto the infamous Kuataika Track. The clay surface was slightly greasy from the persistent drizzle but the steep climbs seemed less dreadful than I remembered. A 200m descent down Whites track brought us into North Piha and the second support stop. Michael and Penny had hoofed it just before I arrived, with Jim further ahead. Several fresh supporting runners were waiting to tackle the next section to Karekare but Shane, Dan, and I set off first. 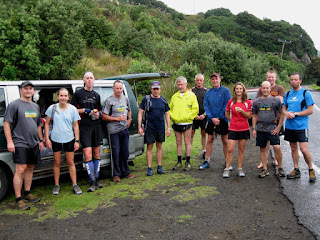 28km was the furthest I had ever run before, so every step beyond Piha was a journey of discovery. As we pounded along the road to Glen Esk Valley I could feel my knees tightening slightly but otherwise felt great. I was relishing the adventure. As we ascended to Kitekite falls the drizzle turned to rain which hung around for the rest of the day. A fast walk allowed me to keep up with Shane’s ceaseless shuffling run up the hill until we emerged onto Piha Road. Not far along the road we were halted by Vicki Woolley shouting to us from behind – something about “Penny” and “AWOL”. Dan turned back to find out what was going on while Shane and I continued onwards. At the end of Log Race Road Shane took the wrong entrance to the Mercer Bay Loop Walk then headed out toward the lookout on the headland. I caught sight of him in time and called him back to the correct track. Coming down Comans was a bit muddy so due caution was exercised to avoid taking a spill. Near the top we passed Jo and were soon at Karekare carpark to rendezvous with the van. A surprised Stuart enquired if we had passed Penny as she ought to have been well ahead of us by this time. Dan ended his run here as he had a wedding to attend. Everyone was surprised that Jim was not stopping at the van to resupply, but his decision to be self sufficient proved wise later on when he was too far in front to be met by the van. By now we were all completely soaked and looked (and felt) like drowned rats. A fresh pair of socks was in order, as the assorted stones and leaves collected in my shoes were starting to get irritating. As we set off up Zion Hill together, Shane and I congratulated each other on achieving our first ever marathon. By this stage the tracks were saturated and seemed to have reverted to winter condition. Knowing that the halfway mark had been passed was a huge relief and I was still feeling reasonably good. It wasn’t until starting the climb up Muir track I began to notice that tiredness was creeping in. Once on Gibbons Shane kept going at a fair clip while my pace slowed due to the mud. For the first time all day I was running alone. This track has a reputation for being muddy and this was no exception. 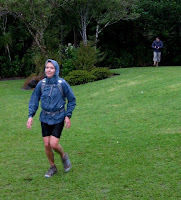 The downhill section was exposed to the cool breeze which, coupled with the fact that I hadn’t been eating as much as I should have due to the slippery technical nature of the track, soon cooled me down and I began to look forward to dry clothes at Whatipu. 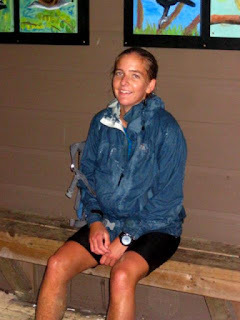 Cold, wet, tired, hungry, and alone – but enjoying it! 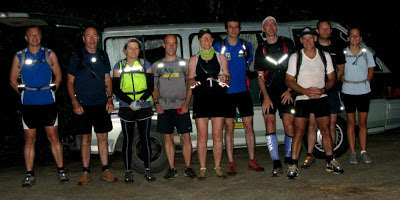 The van was a welcome sight and I quickly put on a warm polyprop and refilled my water before heading up Omanawanui. Shane had waited for me to arrive at Whatipu and we set off together again, this time accompanied by Jonathan Douglas and his son Jake. The three of them soon disappeared and I was caught up by Tom Frentz who kindly stayed with me for this entire section even though it was mostly walking. By now I was definitely tired and my legs were getting tight. When Mum met us at the top of the Omanawanui track and asked how I was I had only one reply: “Hurting!” A steady plod brought us to the top of Karamatura Track, which is the last steep descent on the Hillary Trail. The abundance of mud and roots demanded concentration and my knees were brought to the edge of mutiny at each big step. At last the seemingly interminable downhill ended and we jogged into the last support stop. My body was telling me in no uncertain terms that it would be nice to stop here, but I was determined to finish even if I walked the last 10km to Arataki. After running 63km I wasn’t about to let a little pain and tiredness stop me now! This last stage is mostly gravel roads, with only one technical track to go: the dreaded Hamilton Track (otherwise known as where the mud monster lives). Jogging along the dam roads with Jonathan my ‘running’ got slower and slower until it was barely more than walking speed. My legs were so tight that the range of motion in my knees was inhibited, reducing me to an agonising shuffle. Finishing was now 100% certain – there were no more chances to opt out! Once at Hamilton Track, Jono raced ahead to catch up with Shane, Jake, and Richard Cross. For the second time that day I was cold, wet, tired, hungry, and alone – but this time I most decidedly was not enjoying it! The rough, muddy terrain dictated a slow pace and I soon cooled enough to don my raincoat and fantasise about dry clothes. When simply walking was a challenge, wallowing through the mud was an excruciating, energy sapping exercise. A shout from up ahead – Richard had come back looking for me and I was relieved to no longer be alone with the mud monster. This was the lowest point for me as I valiantly fought to keep from breaking down, both physically and mentally. Once back on gravel roads I attempted to jog but it was simply not going to happen. Pipeline was a little slippery, but compared to previous tracks it was a footpath. Like a horse sensing its stable, once on Slip Track my pace picked up slightly and I even managed to run down the last slope to the cheering supporters at Arataki Visitor Centre. Elation at completing the Hillary Trail was superseded by the relief of simply being able to stop after 14 hours and 4 minutes on the go. Yes, I was stiff and sore the next day and during the run I had points where I wondered at the sanity of our endeavour. The first 50km had been easy but the final 20km required me to dig deep and summon every ounce of mental fortitude. Still, the real question is not “why?”, but WHY NOT? Jim was the first home in 11 hours 49 minutes – not bad for his longest run in more than a decade. Michael and Shane finished before me (12:38 and 13:22 respectively) with Simon and Tony turning up only 10 minutes after I finished. Penny arrived in 14:27 hours, after her navigational errors resulted in her covering a total of 82km – 10km more than anyone else!